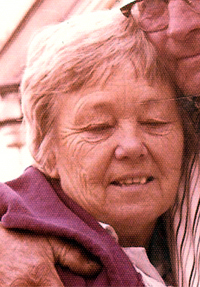 Alma Loraine Blackham Johnson, 91, longtime Bellevue resident, died peacefully in her sleep on Thursday, June 9, 2011, at Blaine Manor in Hailey. Alma was born Feb. 25, 1920, in Twin Falls, Idaho, the daughter of Morley B. and Laura (McBride) Blackman. She graduated from Castleford High School. She married W. W. "Hap" Johnson on Sept. 17, 1938, in Buhl, Idaho. They lived in the Castleford, Buhl and Twin Falls areas until moving to Ketchum in 1957, then to Hailey and finally to Bellevue, where they raised their three youngest children. Hap died in 1984. Alma was a full-time mother to seven children. After moving to Ketchum, she also was a waitress at the Alpine Café, and a cook at the Western Café and the Sun Valley Deli. Alma's hobbies were gardening and raising children and grandchildren, as well as tending to any waif who may have needed a hug and a pat on the back. She was a warm, loving mother, friend and confidant, the best mother and grandmother anyone could ever hope for. She lived a quiet, full life and moved on to a better place where she will be free of pain. Alma will be sorely missed by those who love her. Family members include her son Dennis (Judy) Johnson and their children, Shelley and Tracey of Boston, Mass. ; three daughters, all of Bellevue: Linda (Byron) Downard and their children, Terri Sanders and Tiffany Sanders; Marla (Tyke) Mink and children Marvin, Mike and Darin Burrell; Kim (Jon) Thomas and children Jacob and Kevin; her twin son and daughter: Dana Johnson and David (Carol) Johnson and children Happy, Amos, Ben, David and Daniel of Pecos, N.M.; her sisters: Arletta Caputo of California, Irene Thompson of Castleford, Belva (Jack) Coval of Twin Falls; and son Ben's daughters Christa and Faith, of Ketchum. She was preceded in death by her husband, "Happy," son Ben, her parents, and brother Eugene Blackham. We all love you, Mom. Services will be at a later date. The family suggests that gifts in Alma's memory be given to Blaine Manor, P. O. Box 927, Hailey, ID 83333. Condolences, memories and photos may be shared at www.woodriverchapel.com. Arrangements are under the care of Wood River Chapel of Hailey, Idaho.